Once upon a time there was a fairy. She loved to sparkle and be around sparkly objects and people. She searched high and low for a special headpiece, one that glittered from a distance. It's hard for fairies to shop in stores because they tend to break things, and the "you break it, you buy it" rule gets expensive. So, the fairy shopped online and found the beautiful Glittering Rhinestone Headpiece. 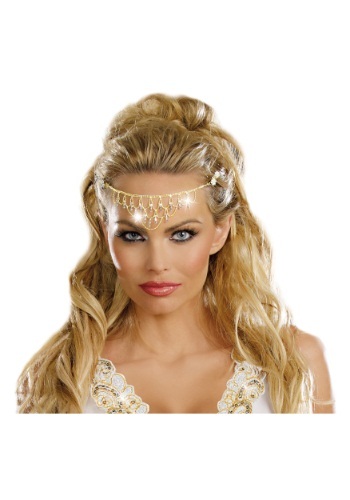 The fancy Glittering Rhinestone Headpiece is also great for gypsy costumes, and added flare during belly dancing. The gold-tone 8 inch headpiece has claw clips on each end to clip into the hair. The dainty loops and dangles drip with tiny rhinestones. Add the Glittering Rhinestone Headpiece to any costume for added whimsy and sparkle.